Cable Matters Mini DisplayPort (Thunderbolt™ 2 Port Compatible) to DVI Cable in Black 25 Feet by Cable Matters at Tobby News. MPN: FBA_101010-BLACK-25. Hurry! Limited time offer. Offer valid only while supplies last. Cable Matters Gold-Plated Mini DisplayPort to DVI cable is an indispensable companion for your Mac, PC, and tablet equipped with Mini DisplayPort. Cable Matters Gold-Plated Mini DisplayPort to DVI cable is an indispensable companion for your Mac, PC, and tablet equipped with Mini DisplayPort. 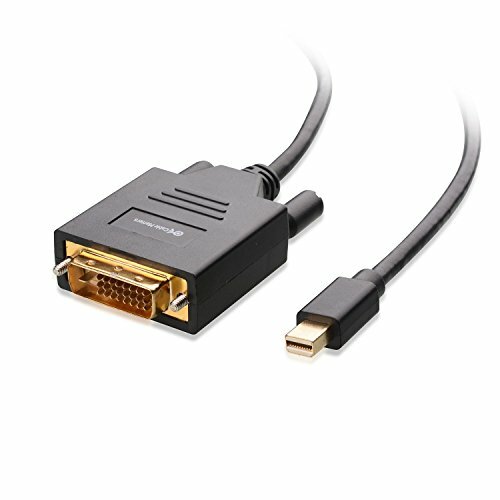 Directly connect your laptop or tablet to a monitor for high-definition video streaming (1920x1200 / 1080p) without a separate DVI cable. Extend your desktop to a second monitor for an expanded workstation, or show presentations on a projector. Low-profile connector with molded strain-relief design increases the cable durability. Ergonomically designed easy-grip treads make plugging and unplugging a breeze. The combination of gold-plated connectors, bare copper conductors, and foil & braid shielding provides superior cable performance.